Adult. One size fits most. 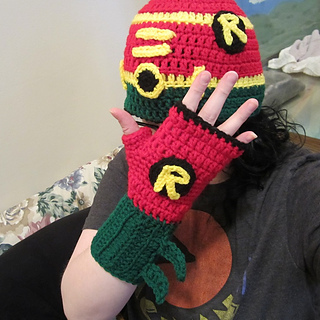 I made this Robin hat and glove set (inspired by Batman and Robin), and it seems you could easily tweak the colors and patches to create many of your favorite superheroes! I made this to fit my head. (Average size adult female.) I’m making a Batman version for my husband, (Gray, black, and yellow), and to fit him I usually just add several more rounds at the bottom of the hat because it fits him in width but is too short. So I’d say one size should fit most adults. 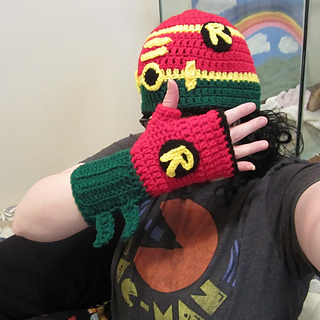 I use a K hook and double crochet stitches through most of this, so it can work up pretty fast! 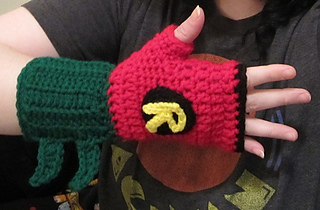 I’m thinking of switching some colors to Green/Orange/Gold and making an Aquaman version next! I bet a Superman/Supergirl version in Red/Blue/Yellow would work out great too!